Police arrest Russian human rights advocate, former Soviet dissident, Ludmila Alexeeva at an unauthorized protest in Moscow. Police says more than 50 activists were detained for "administrative offenses"
Moscow, Russia (CNN) -- Moscow police have detained a number of anti-government opposition demonstrators following an unsanctioned protest in a downtown square just hours before the New Year. "About 40 people were detained out of more than 200 who arrived there," said Alexander Averin, activist with The Other Russia opposition group. Averin was among the protesters but left the scene soon before the police took control of it. Among the detained were author-turned-opposition figure Eduard Limonov and 82-year-old Lyudmila Alexeyeva, a veteran human rights activist and head of the Moscow Helsinki group. "The police didn't beat anybody with truncheons, but they handled the protesters quite roughly," he said. The activists announced plans to hold an opposition demonstration well in advance, but the Moscow mayor's office refused to authorize it. The activists went ahead with it anyway, calling it "a public New Year celebration." 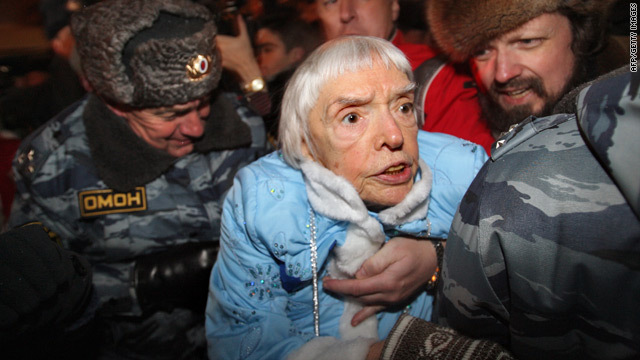 Alexeyeva spoke to CNN briefly on the mobile phone as a police bus was carrying her and other detained protesters to a local police precinct. "I was dressed as a snow maiden," she said. "We all assembled around a New Year fir tree that we put there. This wasn't a political protest and we didn't violate public order." In the past few days, the Moscow police on several occasions has stated it would not allow an unsanctioned demonstration to take place and would do everything under the law to stop it. "A number of public gatherings were authorized to take place in various parts of downtown Moscow, including the Triumfalnaya Square, where they [the protesters] came to," a duty officer at the Moscow police told CNN. "A different event was planned there, and the police told the Moscow Helsinki Group that this venue is already taken. We offered them a different place to gather days ago, but they rejected it and still came to the Triumfalnaya Square." More than 50 activists were detained, the duty officer said. "They were delivered to nearby local police precincts for administrative offenses." The Other Russia, a radical opposition and human rights activism group, has been attempting to stage their protests on the 31st day of each month that has 31 days -- in a symbolic support of Article 31 of the Russian Constitution which guarantees the freedom of assembly, Averin said. But so far, the Moscow mayor's office has always denied the group a permission to gather. Limonov, who has participated in every such attempt, was detained for 10 days on October 31. But normally protesters are freed shortly after their detention. Ella Pamfilova, the head of the Kremlin council for human rights and the promotion of civil society, told the Russian news agency Interfax she was seeking the release of the activists.